Since coming online in 2006, Raven's Mist has striven to honor and respect all paths, faiths and beliefs by providing a wide and varied selection of products at the most reasonable price possible. The Raven is the messenger of the spiritual world, with the ability to fly through the Mist that separates the spiritual and earthly worlds. Raven's Mist is here to honor the God and Goddess in all their forms. We hope that we can help you on your spiritual journey. We are adding new items on the site regularly,so be sure to check back often . If you are looking for something and can't find it,or would like to order a large amount of something email us and we will try to find it for you. [email protected] We would love to hear from you. 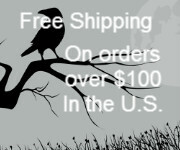 Remember you get Free Shipping Standard On Orders Over $100 to the 48 contiguous states Free Gift On All orders Over $20! If you have a request for the gift email if not the Goddess will guide our hands . Must be 18 or older to order Metaphysical and healing lore information is for educational, inspirational, and entertainment purposes only. Mystical lore on healing and spiritual healing information is not to be construed as prescription, diagnosis or health care information. See your physician or other health care practitioner for all ailments, disease and injury. We will happily ship orders to our customers outside of the 48 contiguous United States by using the following procedure. 1. Please email us the complete list of products that you wish to order, including the SKU or "Part Number" for each item; the quantity of each item; and your complete name and mailing address. You may use the "Contact Us" link at the top of the page. On the subject line type "international order" or "Order to Alaska/Hawaii" (as the case may be). 2. We will determine the total for your order and the amount needed to ship the order, and contact you within 1-2 business days. 3. If you approve of the total and shipping cost we will send a PayPal payment request. Once we receive your payment, we will process your order for shipping. While most orders are processed on the day in which they are received, please allow up to 3 business days for your order to be processed. Orders received on Weekends, Holidays, or Holiday Weekends will be processed within 1-3 business days after the order is received. Sometimes items will become temporarily unavailable, due to being on backorder from our suppliers. While we make every effort to keep item availability updated, sometimes items will go out of stock unexpectedly, and we will have to wait until our supplier sends us a new supply of that item. When that happens, we will send your backordered items to you as soon as possible when it becomes available again. The amount of time it takes to receive an item from a supplier can vary greatly from one manufacturer to the next. We apologize for any inconvenience that this can cause. We will do our best to ensure that you receive all of the items that you have ordered as quickly as possible. Prices are subject to change without notice. The prices listed on our website will be the most accurate and up to date.Be sure to keep an eye on the NEW ITEMS category of our website, as we constantly bring in new items to replace those we have discontinued. If you want to return a product to Raven’s Mist you must contact us within 30 days of receipt by emailing [email protected] You must have the original invoice number to refer to. Returns may be subject to a 10% restocking fee. Due to the increase in shipping costs we reserve the right to bill your account for all shipping fees billed to us due to a package being returned or refused.